National Agriculture Day, March 18, spotlights American agriculture and serves as a reminder that agriculture is part of us all. The U.S. Agricultural Safety and Health Centers join producers, agricultural associations, corporations, students and government organizations in marking this occasion. "We support the Ag Day message and goal of raising awareness of agriculture in modern society," said Scott Heiberger, U.S. Ag Centers spokesman. "And since agriculture is dependent upon people, it's important to highlight their safety and health." The 10 Centers (www.cdc.gov/niosh/oep/agctrhom.html) are funded by the National Institute for Occupational Safety and Health (NIOSH). Visit the Centers' YouTube channel (www.youtube.com/user/USagCenters) for new content and fresh ideas about how to stay safe while working in agriculture, forestry and fishing. Topics include: personal protective equipment, livestock safety, tractor and machinery safety, child development, emergency response, grain safety, pesticide safety, heat illness prevention, ladder safety and hearing protection. 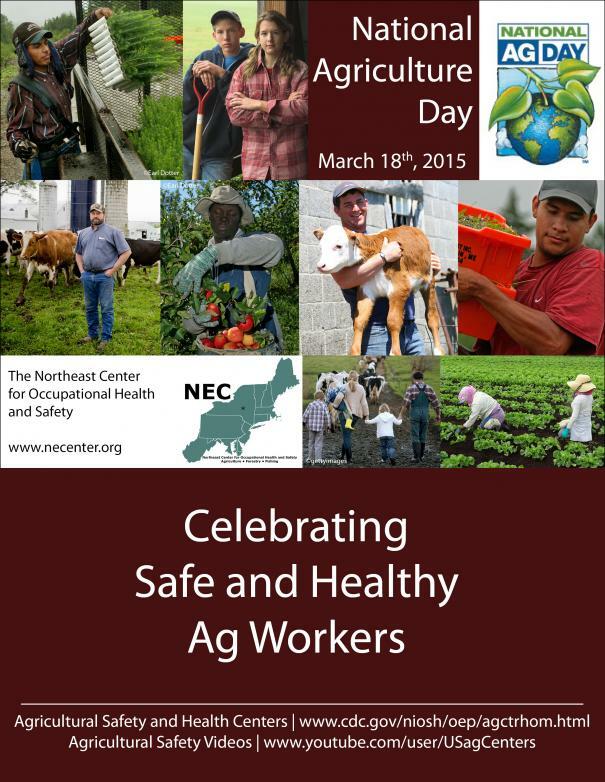 National Agriculture Day is being hosted by the Agriculture Council of America (ACA). National Ag Day is celebrated in classrooms and communities across the country. For more information on National Agriculture Day, go to www.agday.org.